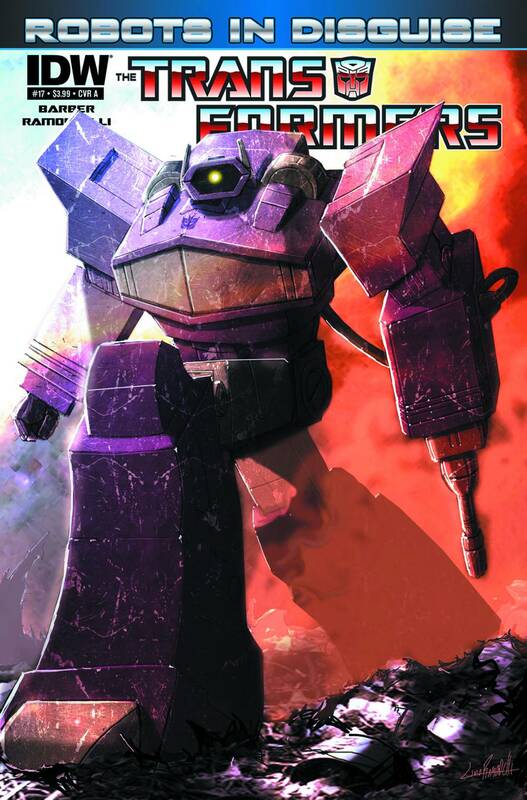 Shockwave has always been the cold, emotionless and calculating Decepticon but not much has been known about his past. The latest issue of Robots In Disguise delves into the character and adds some new elements. Do those changes work or completely change the character? Find out after the jump! Previously in Transformers: Robots In Disguise: Attempts at a new, peaceful life on Cybertron between Autobots and Decepticons have failed. Megatron returned, trying to overthrow Bumblebee and the newly formed government. The Autobots came out victorious but not without losses on both sides, as well as the neutral citizens caught in the middle. Shockwave is hands down my favorite Transformers character. While he didn’t play a huge part in the cartoon, his role in the original Marvel series was much greater. Always emotionless, he made decisions based on calculations and at one point became the leader of the Decepticons. So, when I saw that this issue of Robots In Disguise would be focusing on him, I had to read it (which honestly I would have done anyway). His presence hasn’t been very great in the comics so far but it was revealed in the sister title, More Than Meets The Eye, that Shockwave was once a senator who was forced into the “Shadowplay” process, making him the cold ‘bot he is now. This was a great reveal and a new addition to a character whose past hasn’t been shown much in any of his appearances. Though I liked it, I worried that this may change Shockwave in a way that wouldn’t fit the character. Fortunately, everything works exceptionally well. We see a younger and visually different Shockwave who long ago on Cybertron studied under the scientist Jhiaxus. When Jhiaxus leaves after creating the gestalt (or combiner) technology, his role falls to Shockwave who soon becomes a senator. After trying to reveal a conspiracy in the senate, he is forced to undergo the “Shadowplay” process, changing him into the current incarnation of Shockwave. This was all fascinating and it was great to see Shockwave start as a very emotional character and how those emotions ultimately become his downfall. There’s great characterization that naturally progresses into what has previously been established about Shockwave. When he goes about his plan to solve the oncoming Energon crisis, we’re shown the hundreds of Cybertronians he has killed in his experiments and know that he is beyond saving. As we see him slowly plant the seeds of his plan that long ago and its revelation at the end, it’s quite impressive and fits perfectly. Some parts of the story are a little questionable, such as Shockwave’s original idea of getting Orion Pax to become the new Prime. After his change, he of course abandons this idea but I wonder why it was there in the first place, other than to possibly show how the belief was put in Optimus’s head. Also, Shockwave’s dramatic change seems to be unaddressed by many of the other characters. While I can understand the corrupt senate ignoring it, only Orion Pax, Starscream and Megatron acknowledge it. With the senate’s overreaching control, I guess it makes sense, but it was still a little hard for me to believe. The dialogue is great and I could hear Shockwave’s voice from the cartoon saying these lines. All the ideas in the story are very complex and mature, much different from the 80’s cartoon or even the comics that came before. It’s nice to see that the story has matured along with its audience. The only problem is that it might not be new reader friendly as there are lots of characters, many of which have barely made appearances in other Transformers media in the past. Still, John Barber knows how to write these characters and expand their history with new ideas while maintaining the personalities the fans have come to love. He looks to be setting Shockwave up as a new ruler of the Decepticons, or even Cybertron, and it really feels like a nod to the original series. Something big is brewing and I can’t wait to see it unfold. I’ve had mixed feelings about Livio Ramondelli’s art in the past, wavering between enjoyment and disappointment. I love his designs for the Transformers, giving them a “blocky” appearance that is reminiscent of the old toy packaging images while not being as stiff. His panel layouts and storytelling though haven’t sat right with me, making events and actions difficult to make out. With dark coloring added on top, it made for a frustrating reading experience. To my surprise, much of that has changed and I now find myself quite the fan. His coloring is much brighter, allowing his work to be seen better and many of his panels are larger, making the flow of the story much better. At no point did I have trouble understanding what was taking place, though some panels were still small leaving close ups hard to identify whose face was whose. The work on this issue was very well done and I’ll be less inclined to be nervous of reading an issue with his art in it. Quick note: I would kill for a poster or original art of the full page shot with Shockwave standing in a hallway with the bodies of dead Cybertronians hanging from the ceiling. Truly dark and horrifying stuff! I was worried that my love for Transformers, and Shockwave in particular, would make it difficult to remain unbiased. In actuality, I probably held this issue under more scrutiny than most, due to my love for the character. The additions to Shockwave’s past are wonderful and reveal much about the character’s personality while keeping his essence in tact. Livio Ramondelli’s art has improved and converted me to a fan. This issue is a great character piece and once again proves why IDW is putting out some of the best and most original Transformers comics in a long time. Transformers: Robots In Disguise #17 earns 4.5 out of 5 stars.